Cytosine residues in the v2 region of the SEPT9 gene may become methylated in colorectal cancer tissues. When DNA isolated from plasma samples is treated with a high concentration of bisulfite, unmethylated cytosines are converted to uracil while methylated cytosines remain unchanged (Figure 1). As a consequence of treatment, the DNA sequence is altered based on methylation status and can be analyzed by Real-Time PCR amplification (Figure 1). 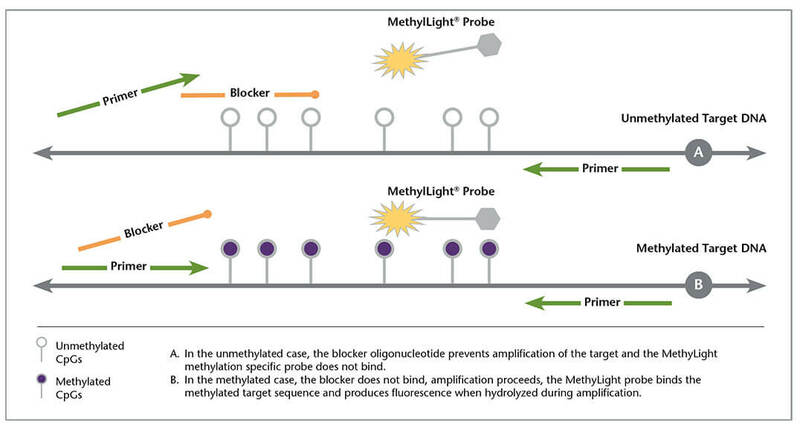 The Epigenomics’ methylation core technology combines the use of primers that amplify the target biomarker regardless of methylation status, with a blocking oligonucleotide to suppress the amplification of unmethylated DNA, and a methylation-specific probe to detect the amplified methylated sequence (Figure 2). The proprietary methylation core technology enables detection of low copy number tumor DNA in a background of non-tumor DNA in plasma.